I have created a monster. Several, monsters in fact. As someone who loves to cook and lavish food onto others, I have found that my beloved friends and family have developed high expectations. If we go out for dinner and they are somewhat unsatisfied with their order, they look up at me and say, ‘You can do better.’ If they watch TV or a movie and stumble upon a particularly drool worthy dish, I will receive a text, ‘Hey, what do you think about making that for me?’ I even had a request to make lemon bars for a friend of mine after she had a delicious dream of tasting desserts for a bake sale contest. The point of all this is this: if you have the ability and means to recreate delectable food for your loved ones, your loved one will demand it. A recent example of this was when my husband and I were watching the Big Family Cooking Show on Netflix. Whilst scrolling the news on his phone, my husband’s ears perked up over a particular dish that one family made with fresh pasta, ham and cheese. And so it began. I kneading the past dough by hand, rolled it out by hand, smothered it in a creamy béchamel sauce, topped with copious amounts of cheese and ham and ever so delicately rolled it up. Words can not express the joy of that first bite. The crispy outer pasta layers, the soft center, the swirls of pasta and ham held together with melted cheese and creamy sauce. Heaven in a bite. Now my husband has begun asking for other baked pasta dishes to have the same construction. Lasagna with sausage, pesto with chicken and endless other flavor combinations. Like I said, I have created a monster – a monster intent on eating pasta. Over medium low heat, melt 2 tbsp on butter in a medium saucepan. Allow the butter to clarify (you’ll know when the butter has clarified when the bubbling has calmed because most of the water has evaporated off). Once butter is clarified, stir in 1 tbsp of flour and whisk together .Let cook on medium low heat for 1-2 minutes. You want the roux (flour and butter mixture) to cook but not to brown. Slowly add the warm milk a little at a time, whisking it together as you go. Once all milk has been poured in, increase heat and continue to whisk until boiling. Season with salt, onion powder, garlic powder and paprika. Once at a boil, reduce heat to low and continue to cook for 2-3 minutes stirring occasionally. Remove from heat after 2-3 minutes. Combine chicken broth, crushed garlic cloves, sprigs of thyme and white wine together in a pan. Bring to a slight simmer over medium high heat. Cook together until reduced by half. Cook pasta sheets in boiling water until al dente. Carefully remove from water and lay flat on a large surface. If you are making a large pasta sheet by hand, cook your sheet of pasta in a very large pot. Remove with either a pasta insert or do what I do and pour off hot water from the pot, and dilute remaining water with cold water until it is safe enough to carefully remove the large pasta sheet gently with your hands. When pasta sheet is dry enough and no longer soaking wet, add bechamel sauce and spread evenly. Then top with grated Parmesan and grated mozzarella cheese. Finally top with slices of ham. Starting at one of the shorter end, fold the side up and continue to roll until all the pasta is in one giant roll. Tightly wrap in plastic wrap or aluminum foil and place in the fridge or freezer for 15-30 minutes or until the roll is set enough so that you can slice it without it falling apart. When roll is set, cut into slices 2 inches (4.5 cm) think and place in a baking dish. Sprinkle with asparagus spears. Top each slice with 2 tbsp of white wine and thyme sauce and cook in the oven at 450F /220 C uncovered for 25-35 minutes. Baking time will vary depending on temperature of chilled roll when placed in the oven so use your best judgment and keep a watchful eye. Pasta roll ups are done when cheese is bubbling, center is hot and the outer layer is slightly crispy and golden brown. Let rest for 5 minutes before serving. Over medium low heat, melt 2 tbsp on butter in a medium saucepan. Allow the butter to clarify (you’ll know when the butter has clarified when the bubbling has calmed because most of the water has evaporated off). Once butter is clarified, stir in 1 tbsp of flour and whisk together. Let cook on medium low heat for 1-2 minutes. You want the roux (flour and butter mixture) to cook but not to brown. Slowly add the warm milk a little at a time, whisking it together as you go. Once all milk has been poured in, increase heat and continue to whisk until boiling. Season with salt, onion powder, garlic powder and paprika. Once at a boil, reduce heat to low and continue to cook for 2-3 minutes stirring occasionally. Remove from heat after 2-3 minutes. Then top with grated Parmesan and grated mozzarella cheese. Finally top with slices of ham. Fold the longer sides of the sheet in. Starting at one of the shorter end, fold the side up. Continue to roll until all the pasta is in one giant roll. Try to keep it as tight of a roll as you can. When roll is set, cut into slices 2 inches (4.5 cm) think and place in a baking dish. Sprinkle with asparagus spears. 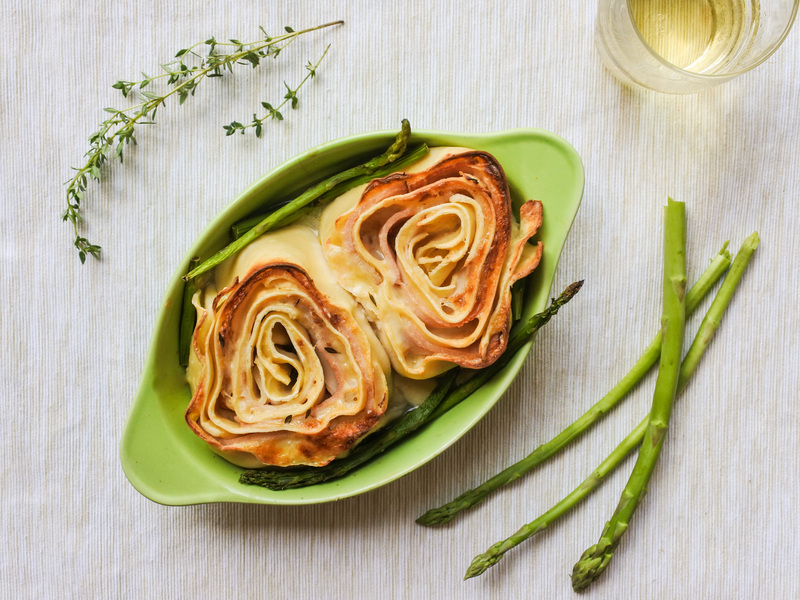 Top each slice with 2 tbsp of white wine and thyme sauce and cook in the oven at 450F /220 C uncovered for 25-35 minutes. Baking time will vary depending on temperature of chilled roll when placed in the oven so use your best judgment and keep a watchful eye. Can you please come to Arkansas and make the Ham and Cheese Pasta Rolls for me? I am literally drooling right now!